This week, after many months of quiet anticipation, I reaped the first luscious rewards of my life as an urban beekeeper – a staggering 10 litres of perfect golden honey. And I’m told this is a very modest haul… Now, I always get a child-like thrill out of producing food “from the land,” but this one seriously took the cake (and will probably end up in more than few). Pure smug, exuberant delight. My current Facebook status is all about the honey, and I’ve been dishing it out by the jarful to friends, neighbours and anyone else that knocks on the door. Frankly, I think I’ve earned the right to skite. But, now, with a filled to the brim bucket full of honey staring at me from the bench, and the likelihood of three or four more before Autumn, I’m starting feel a bit daunted. What does one do with untold litres of honey, albeit gorgeous and unpasteurised? In the meantime I have this year’s already sizeable honey haul to contend with. As a family we’ve decided on homemade Christmas presents this year (except for Baby Olive -she shall be lavished with love and gorgeous things), and I think beautifully packaged home-grown honey falls into that category. I’ll find some pretty glass jars and write up nice little labels, extolling the merits of local, unpasteurised honey. For example did you know that honey from your neighbourhood helps to reduce the symptoms of pollen allergies? Honey contains traces of pollen from all flower types visited by the hive, which when ingested helps to desensitise your immune system. Doesn’t work with pine pollen sadly, which is the bane of my existence every spring – unfortunately conifers are entirely and quite prolifically wind pollinated. As a very keen home wine maker and distiller I’m seriously looking forward to making my own mead. This ancient elixir drunk by the Vikings, ancient Britons and many other dating back as far as 8000 years, is not only delicious, but is apparently loaded with health-promoting qualities. From mead stems the further and even more exciting possibilities of mead brandy, which probably promotes various liver shrivelling qualities, but imagine the flavour! But that’s all for later in the season. First of all I need to find ways to introduce honey to a lot more of my cooking. When I think of it there are few situations where I regularly use honey in savoury dishes (largely, methinks because most food stops being savoury when you douse it in honey). I always use honey in Chinese-inspired marinades for meats, in teriyaki sauces, when smoking fish, in certain vegetable soups (most notably pumpkin, kumara and/or carrot), and of course with mustard. Not exactly a recipe I know, but honey with oozing and fizzy blue cheese is pretty fabulous too. But that, dear reader, is probably about it. When it comes to desserts and baking the possibilities and the breadth of my repertoire are wider. I make both panforte and panpepato with honey, as well as honey gelato, torrone, baklava (when I can be bothered with filo pastry), various things called “honey cake,” and that terribly outmoded, but defiantly delicious, honey and rice bubble slice. Beyond that I’m really scraping the bottom of the inspiration cauldron. So, beloved Foodlovers family, I need your help. Inspire me. Excite me. But mostly on hot toast with butter! Sounds divine. I had hoped you lived around the Wellngton area as my source of home grown honey has finished. 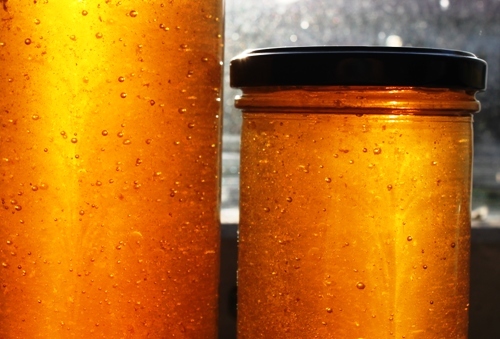 Do you know of any folk who sell their home grown honey in and around Wellington? You will need 4 frenched lamb shanks. If unavailable, use whole lamb shanks and ask the butcher to saw them in half for you. Place a heavy based saucepan over high heat add 1 T oil and 30g butter, then add lamb shanks. Brown shanks on all sides and remove to plate. Reduce heat to medium and add 1 chopped onion, cook gently for 5 mins until soft. Add 375 ml (1 1/2 cups) water, 1/4 t grounds saffron threads, 1/2 t ground ginger, 2 cinnamon sticks and 4 coriander (cilantro) sprigs tied in a bunch. Season, to taste. Stir well and return lamb to pan. Cover and simmer over low heat for 1 hour. Remove zest of 1/2 lemon in wide strips and add to the pan, cook for further 30 mins. Add 300g pitted prunes and 2 T honey, cover and simmer for a further 30 mins or until lamb is tender. Remove and discard coriander sprigs. Serve hot, sprinkled with 1 T roasted seasame seeds. Penny’s modifications: Soften the onion in the microwave, and bung everything into a big casserole pot. (I used my big clay pot which is similar in philosophy to a tagine). Stick in the oven for 2-3 hours until cooked. 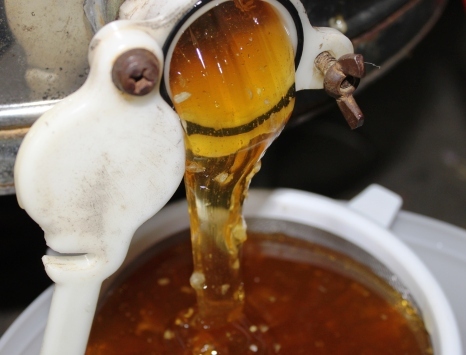 Honey can also be used in natural cosmetics eg face masks. Best made up fresh though. Am thrilled by your article. Have just been to local beekeeper to get some Beeswax for the Top Bars for my two hives & he thinks this system of beekeeping is not legal in NZ! He has told me to contact MAF before I go any further. He asks how the Top Bars are going to be accessible & sturdy enough for the honey comb to be inspected for disease etc? As he thinks it is regulation to have a solid frame. Please can someone advise me if I should proceed with this project of backyard Top Hive beekeeping in NZ. Thanks! Can I be your first paying customer in Devonport Virgil? I want to have a go at keeping bees, but everyone says I am mad with a 2 year old, I guess you are proof that that isn’t so! And I am now secretly hoping that your bees will spend some time in my garden this summer! Di unless your 2 year old is allergic to bee stings (well below 1% of the population) you’ll be fine. Bee’s are not aggressive creatures and everytime I’ve been stung has been becuase I’ve done something stupid. Where in Devonport are you? I have the only bees south of Hauraki corner apparently, so any you see are mine! I’m in Albert Road, I have planted an orchard (sounds a bit grand for the size it is) and a herbal ley, and except for the kingfisher that has recently adopted us, the garden doesn’t really feel alive. That and the fact that my flowering blueberry hedge has yet to see its first bee, makes me think that we need more bees in suburbia. Oh, I know your place now- pomegranate trees too huh?. Olive and I walk past regularly on our morning walks. My bees def vist lavender and rosemary bushes near you. How is the mead-making going Virgil? Any reports? Need anyone to taste it? After Lent of course. Its tasting very, very good. Still a little sweeter than I would like, but plenty of time for it to loose that yet. Very reminicent of a good aromatic wine like gewurtz or riesling ie very fragrant and almost oily mouth-feel. I will be seeking advice on the way to boost the quantity of responses alone weblog, just how would you succeed in carrying this out?